University of Texas Rio Grande Valley's Terry Winn (3) keeps his position under the net against Our Lady of the Lake in a nonconference game at the UTRGV field house Tuesday, Jan 1, 2018, in Edinburg. 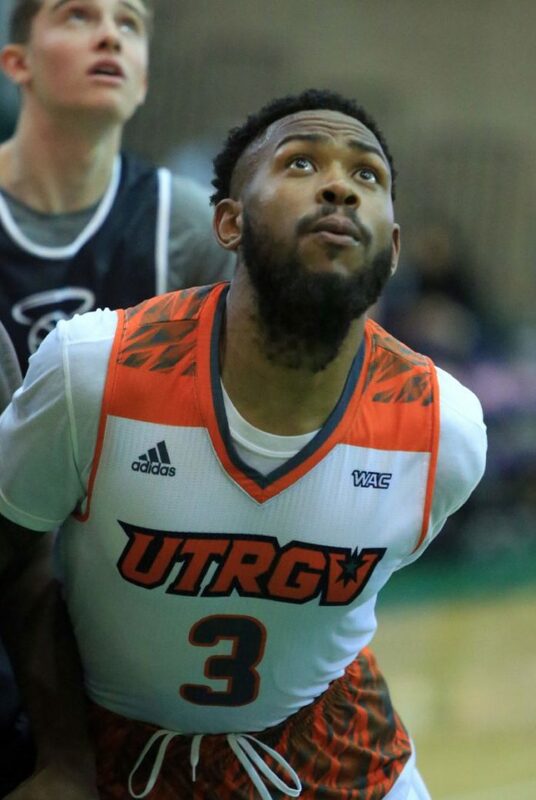 EDINBURG — Looking ahead to the UTRGV men’s basketball team’s trip to Costa Rica this week, sophomore Javon Levi said his No. 1 expectation is to win. Beyond that, Levi said he is also looking forward to some of the other items on the itinerary, which include community service, time at the beach and Levi’s most anticipated, zip lining. The NCAA allows programs to play games on a foreign tour once every four years, and UTRGV coach Lew Hill said he thought this year would be the right time to exercise that option. The Vaqueros depart for Costa Rica on Friday, having used 10 extra practices in recent weeks to prepare for matchups against the Costa Rica national team and club team Coopenae San Ramon ARBA. The NCAA typically limits programs to just a few hours of individual skill work each week during the summer, but committing to a foreign tour opens the door for a team to hold 10 full team practices similar to those conducted during the regular season. Hill has had plenty of teaching to do with a roster heavy on newcomers. UTRGV graduated five seniors at the end of last season, including Nick Dixon and his team-leading 20.3 points per game. Also not returning from last year’s team are Xavier McDaniel Jr. (9.2 points, 4.3 rebounds per game) and Lew Stallworth (5.7 points, 3.2 assists per game). Hill, Winn and Levi all said they know very little about the level of competition they will face in Costa Rica. The group has, however, been preparing for FIBA rules, scrimmaging under those conditions with referees on Thursday. Instead, the focus is on implementing what the Vaqueros have practiced and giving the newcomers their first taste of action with the group.